James & Bobby Purify were an American soul music duo. James Lee Purify (b. 1944) and Robert Lee Dickey (b. 1939) came from Florida, and were not brothers but cousins. As a guitarist, Robert had been a member of R&B group The Dothan Sextet, where his cousin James also came to fill in as a singer. In 1966 they came to the attention of producer Papa Don Schroeder, who took them both to record at Fame Studios in Muscle Shoals. 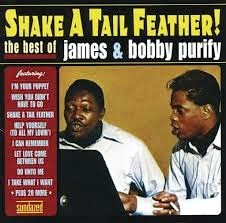 Here the idea of having them sing together as a duo was conceived, and they took the stage name James & Bobby Purify. They recorded the Dan Penn / Spooner Oldham song "I'm Your Puppet", which became an instant hit on Bell Records, getting not only to #5 on the R&B chart but #6 on the Billboard Hot 100 too. Lesser hits followed in 1967, first with another Penn/Oldham song - "Wish You Didn't Have To Go" charted at #27 R&B. Production then moved from Muscle Shoals to Chips Moman's American Sound Studio in Memphis, where a marathon recording session produced a cover of "Shake A Tail Feather" (originally recorded by The Five Du-Tones in 1963), which charted at #25 pop and #15 R&B. "I Take What I Want" (a Sam & Dave cover) went to #23 R&B, and "Let Love Come Between Us" went to #18 R&B and #23 pop. Two albums were also released. By 1968 their singles were not charting as high, but they were still touring extensively. The next year the hits had dried up and they parted ways with Bell Records. By 1971 Robert Lee Dickey retired for health reasons, and the Purify name slipped away unnoticed. That was until 1974 when Ben Moore was recruited as the 'new' Bobby Purify for another album. This compilation covers most of the recorded output of the 'original' James & Bobby Purify, during their years with Bell. Along with "I'm Your Puppet" and the other hits are a good number of b-sides, album tracks and previously unreleased numbers. Some excellent soul music, with just the right balance of pop and gritty southern R&B vibes. so much great stuff here..
any chance of posting some shirley ellis.?? Who were the other band members of the Dothan Sextet?